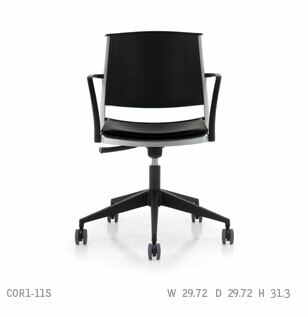 The Corfu Tilter is ideal for informal conference settings and office environments. Its funky, compact and durable - and offers a huge range of options, with combinations of wood, plastic and upholstered seats, backs and arms, and three metal finishes. The Corfu Tilter features a swivel tilt mechanism that has a one-handle pneumatic height adjustment. The five-prong base is available in Black Plastic and Polished Aluminum.